Old Palm Golf Club | Old Palm News - The return of FootGolf! What is FootGolf, you ask? Well, itâs not kicking your golf ball out of the bunker when no oneâs looking. It a new sport of sorts thatâs half soccer, half golf and entirely amusing. 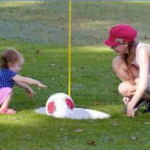 Children 17 years of age and younger are welcome to play FootGolf on the three practice holes at Old Palmâs spectacular Golf Studio practice facility on November 21 from 3:30 p.m. to 5:00 p.m. If kids can kick a soccer ball, they can play FootGolf with the best of them. The nine-hole competition will be played with a soccer ball that kids will kick down the fairway, instead of using golf clubs to advance the ball. The holes are also much larger than normal, making it fairly easy to hole out. Itâs sure to be a blast for all the participants, and parents are invited to watch. To sign up for FootGolf or for more information, call the golf shop at 561-472-5120.